Kingston’s sewage treatment plant could provide irrigation water for the nearby White Horse Golf Course and possibly other uses under a plan now in development. Kitsap County commissioners recently signed a $325,000 “predesign” contract with Brown and Caldwell engineers. The firm was hired to answer a host of questions about the feasibility of producing high-quality effluent at the plant and then putting the clean water to good use. I peppered Barbara with questions that she could not answer at this point, because the detail work is yet to be done. But we know from a previous study by Golder Associates (PDF 18.2 mb) that producing high-quality effluent in Kingston is more than a random thought. Golder found benefits from using the water for supplementing flows in nearby Grover’s Creek while recharging much-needed groundwater in that area of the county. The Suquamish Tribe, which owns White Horse Golf Course, has expressed interest in acquiring the water if various issues can be resolved. 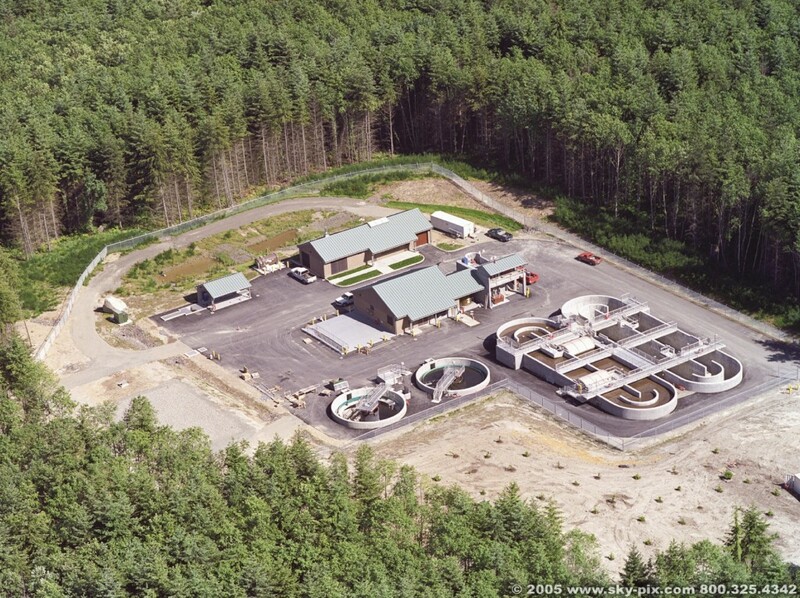 The Kingston treatment plant, completed in 2005, produces an average of 150,000 gallons of effluent per day, currently discharged into Appletree Cove. As population grows, the plant can be expanded to about 300,000 gallons per day. It appears it would be cost-effective to treat the water to tertiary standards with sand filters, although other technologies will be explored. A pond could be built on or near the golf course, which would store the water for irrigation and allow infiltration into the ground. The available water should provide the needs of the course with plenty of water left over. Discharging into a wetland that feeds into Grover’s Creek is another idea, along with providing irrigation at the county’s North Kitsap Heritage Park. Unused water might still be discharged into Puget Sound, particularly in winter months when irrigation water is not needed. One question that always arises with reclaimed water is what happens to trace amounts of chemicals that pass through the treatment process, such as pharmaceutical drugs that mimic hormones. We know from studies that some of these chemicals can affect the growth, development and metabolism of fish in some situations. An analysis by Golder Associates (PDF 18.2 mb) concluded that future treatment processes in the Kingston plant would remove between 80 and 97 percent of endocrine disrupting compounds coming into the plant. Environmental conditions where reclaimed water is discharged would degrade the chemicals further, so the overall risk would be low for salmon and other fish, according to the report. The new study is expected to look further into the risks. Meanwhile, the state Department of Ecology is continuing to work on a new reclaimed-water rule that could improve permitting and monitoring by producers of reclaimed water. 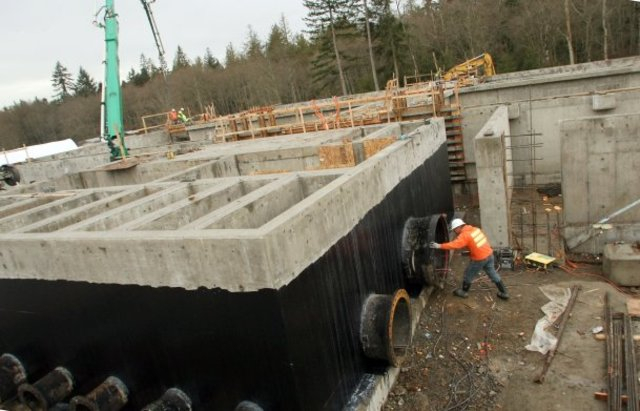 The Kingston project would be similar to what is happening at the Central Kitsap Wastewater Treatment Plant near Brownsville, where construction is adding sand filters as part of an overall upgrade to the plant. The nearby Silverdale Water District has installed about 15,000 feet of “purple pipe” for reclaimed water on the major arterials of Silverdale, including Silverdale Way. The project is part of the water district’s major pipe-replacement project. Another 2,000 feet will be added as part of the Bucklin Hill Bridge project, General Manager Morgan Johnson told me. Much of the new commercial construction in Silverdale is being designed to use reclaimed water for irrigation, and some buildings are being plumbed to use reclaimed water for flushing toilets and other secondary uses. Ballfields in the area could get some of the water. A public-outreach program is being planned to educate the public about reclaimed water and to answer questions that people may have. Under the current schedule, the reclaimed-water valve would be turned on in 2020, but that date may be pushed back, Morgan said. In Kingston, it will take about a year to put the information together and identify a preferred alternative, Barbara told me. Final engineering and design will follow under a new contract if things go as expected. The current contract will examine pipeline routes to convey the water to the potential users. Costs for building and operating the system will be explored. Yet to be determined is how costs and benefits of the reclaimed water will be shared between the county, which owns the treatment facilities, and those who will use the water. That goes for both Kingston and Central Kitsap. Many golf courses across the country — especially in the arid Southwest — are using reclaimed water for irrigation. In a few places where water is in extremely short supply, water systems have begun adding the clean effluent straight into their drinking water. Check out reporter Emily Schmall’s story for the Associated Press. While water is still somewhat plentiful in the Puget Sound area, it only makes sense to find uses for freshwater that would otherwise be dumped into salty Puget Sound.